The role of a broker-dealer is to offer secure financial advice and investment opportunities to clients. Both aspects of the job require different skills and responsibilities, the foremost of which are transparency and prioritizing the client’s interests. A broker-dealer earns a fee by making investments on others’ behalf, so it’s vital to know how and why they may recommend certain options. The delicate relationship between a broker-dealer and their client can be highly beneficial. It can also be ripe for exploitation. The government’s regulating body is facing up to this unpleasant fact and proposing new rules to ensure broker-dealers collect their fees honestly. The NASDAQ Stock Market succinctly defines a broker-dealer as “any person, other than a bank, engaged in the business of buying or selling securities on its own behalf or for others.”1 These professionals play an important role in keeping the market liquid (fluid and active) by acting as a third party between investors and companies. Broker-dealers may handle several investment opportunities such as variable annuities, mutual funds, futures, and stocks. The broker aspect entails helping clients buy and sell items like bonds, mutual funds, or stocks and collecting a commission for doing so (alongside a fee from the investor). Some brokers may charge inactivity fees if you do not trade regularly. As dealers, they buy or sell securities from their own account. Dealers act as principals in this regard, rather than agents executing client orders (as when brokering). Acting as a principal means that it is the advisor’s own best interests which will likely take priority. An unethical agent may make money by recommending unsuitable investments to clients, particularly those in retirement seeking to safeguard and increase their wealth. An unsuitable investment is defined by being inconsistent with an investor’s objectives, best interests, or risk tolerance (among many other factors).2 For example, advising a retired client who depends on investment income to sink a good portion of their portfolio into risky start-up stocks would likely constitute an unsuitable recommendation. Broker-dealers are not currently held to the same standard as registered investment advisors. This is an important distinction to be aware of, especially when it comes to considering how these professionals make their money. A registered investment advisor is bound by the fiduciary standard which is derived from the Investment Advisors Act of 1940.4 This demands the highest level of fiduciary professional behavior. The advisor must work solely on their client’s behalf and in that client’s best interests. Registered advisors must act with complete loyalty and good faith, with due prudence and complete disclosure at all stages of the investment process. So how are broker-dealers regulated? FINRA enforces this standard through suspensions, fines, and permanent bans on certain brokers who violate its rules, as well as overseeing securities arbitration claims from investors. While some rules, such as suitability, are well-defined, the tenets of fiduciary duty can be more ambiguous. This is something that may look to become a little clearer. This rule adds up to a more secure experience for investors. It also spotlights just how crucial of an element trust is when dealing with your financial advisor. No investment strategy can guarantee a profit or protect against loss in a period of declining values. This is one of the reasons why trust is so vital in the relationship between you and your investment agent. Professional judgement and experience coupled with a vested concern in your interests is often the only constant in an unpredictable economy. The best financial advisor is the one who will steer you through retirement by focusing on the safety of your retirement portfolio and continued income, while working to minimize risk of loss. Always choose an investment team who puts your future first! 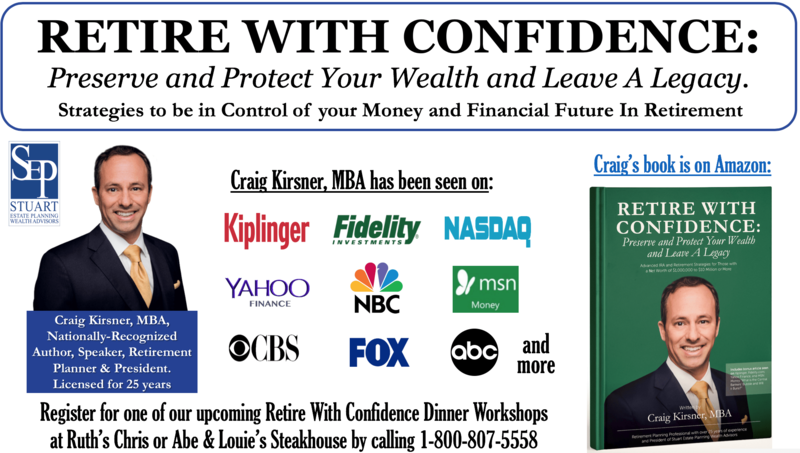 To learn more about how to invest wisely in retirement, come to one of our upcoming dinner workshops at Ruth’s Chris or Abe & Louie’s steakhouse in Boca Raton or Fort Lauderdale. Call 1-800-807-5558 for details or to RSVP. Estate Planning: What Does “Per Stirpes” Mean? Estate Planning: Is a Will Enough? What Is Probate and Why Should You Endeavor to Avoid It? Craig Kirsner, MBA on Are You Uncomfortable With the Losses You Might Have Incurred in October 2018? techcrunch.com on Are You Uncomfortable With the Losses You Might Have Incurred in October 2018? Investment advisory services offered only by duly registered individuals through AE Wealth Management, LLC (AEWM). AEWM and Stuart Estate Planning Wealth Advisors are not affiliated companies. Any media logos and/or trademarks contained herein are the property of their respective owners and no endorsement by those owners of Craig Kirsner or Stuart Estate Wealth Advisers is stated or implied. Million Dollar Round Table (“MDRT”) is a membership organization. Qualifying criteria for membership include attaining specified levels of commissions earned, premium paid or income earned on the sale of insurance and other financial products. The MDRT membership requires the payment of annual dues, compliance with ethical standards, and to be in good standing with an MDRT-approved Professional Association. There are 3 levels of membership which include standard membership, Court of the Table and Top of the Table. The MDRT logo and/or trademarks are property of their respective owners and no endorsement of Stuart Kirsner or Craig Kirsner or Stuart Estate Planning is stated or implied.